Two more weeks in the fantasy Premier League season before it is all done. While the Premier League title is all wrapped up with Leicester as champions, the FPL season has plenty left to play for. In week 37 we have a double gameweek and plenty of great differentials to look at. For this week don’t forget that there are eight teams playing in the double gameweek with Chelsea, Everton, Liverpool, Manchester United, Norwich, Sunderland, Watford, and West Ham United all playing twice in this FPL week. With away matches against Liverpool and Norwich, Watford stand a good chance of picking up six points in both matches. Liverpool have been heavily rotating the squad recently and Norwich look about as doomed for relegation as Aston Villa. While Watford’s recent form isn’t exactly outstanding with a 2-1-3 record, they did show some signs of life with their mini comeback against Aston Villa. The main thing with Watford is that they are excellent bargain buys with several excellent differentials thrown in. One problem with Watford has been the rotation in defense making it difficult to recommend any defenders for this week. GK: Heurelho Gomes – £5.1 – 12% selected: This season Gomes has been the best goalkeeper in FPL and has some excellent matchups to finish off the season. MID: Ben Watson – £4.3 – 0.6% selected: Watson missed out on the West Ham match, but in his four most recent starts has picked up 2, 5, 10, and 2 points including a goal. FOR: Troy Deeney – £5.3 – 6.3% selected: Odion Ighalo was the go-to forward to start the season, but Deeney has been the most consistent forward for Watford this season. He may have picked up negative points against West Ham, but his 13 points from two goals against Aston Villa should give him a boost heading into their last three games. With matches against Norwich (A) and West Ham (H) followed by a home match against Bournemouth to end the season, United have three favorable match-ups as well as everything to play for. They must win all three to stay in the chase for a Champions League place and they have been playing at least marginally better attacking wise. One of the problems with United has been their defense. While they are second in the league in goals allowed this season, they are still error prone. GK: David De Gea – £5.9 – 16.7% selected: While he is the fifth best goalkeeper in FPL this season he did miss out on the first four matches to start. The problem with De Gea is that the team is not a guaranteed clean sheet and his price tag is a bit high. The up side is that he is likely to pick up bonus points with a total of 568 this season. DEF: Antonio Valencia – £5 – 1.6% selected: Valencia has now started and played 90 minutes in United’s last three matches. In this time he has picked up 12, 8, and 6 points including 2 assists and 2 clean sheets. FOR: Anthony Martial – £7.6 – 11.9% selected: 2 goals in his last 5 games for a total of 23 points isn’t a bad return. Norwich and Bournemouth have the 4th and 3rd worst goals allowed records this season giving United forwards some excellent opportunities. FOR: Marcus Rashford – £4.7 – 7.9% selected: Rashford’s goal return isn’t quite as good as Martial’s, but his price tag is significantly lower. He has 2 goals in the last 6 matches, but has only played the full 90 minutes in two of these and could be due for a rest. Chelsea’s recent form isn’t necessarily great at 2-2-2 over the last six matches, but the past two have shown some fire that has not existed for most of the season. Their final three matches are quite favorable. Week 37 is a double gameweek against relegation embattle Sunderland (A) followed by the rotation happy Liverpool (A). Even week 38 is a great pick meaning that players brought in for 37 can remain in play for 38 as Chelsea host Leicester City. With Leicester already crowned Champions they could field a rotated side and will have very little to play for. MID: Eden Hazard – £10.8 – 13.3% selected: The last two matches have seen Hazard return to his player of the year form that spurred Chelsea on to their Premier League title last season. With 3 goals scored in this two matches along with 15 and 9 FPL points, he is going to be a hot commodity with a double gameweek in 37. MID: Cesc Fabregas – £8.4 – 6.1% selected: Fabregas’ form has picked up somewhat in recent weeks with 14 points in the week 31 2-2 draw against West Ham. The week 35 4-1 win over Bournemouth added another 13 points. Aside from these two matches he’s been rather quiet with 2, 1, 2, and 2 points in their other 4 matches. MID: Willian – £7 – 8% selected: Willain has been Chelsea’s most consistent player all season. Recent weeks has seen his points drop, although that is mostly down to missing two matches and not playing the full 90 minutes in two more. Still, his last three matches have him picking up 2, 7, and 4 points with 1 goal and 1 assist. With eight teams playing two matches in week 37 this is the last big chance for FPL managers to really pile on the points. While season long favorites like Riyad Mahrez, Harry Kane, and Jaime Vardy are all viable options this weekend, they do not have the added benefit of playing a double gameweek. Still, I would advocate keeping them considering their opponents. 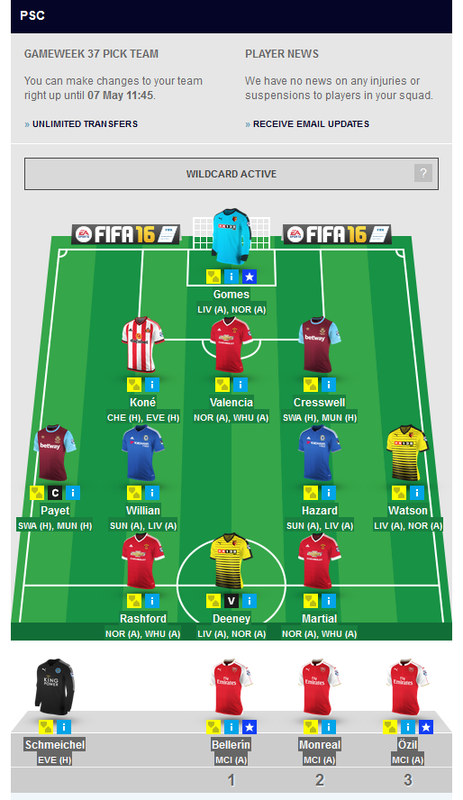 With only two more weekends of Premier League soccer remaining, now is the time to get your FPL team sorted. Good luck and have fun!